who can be seen in the above photograph waiting for their American guests. 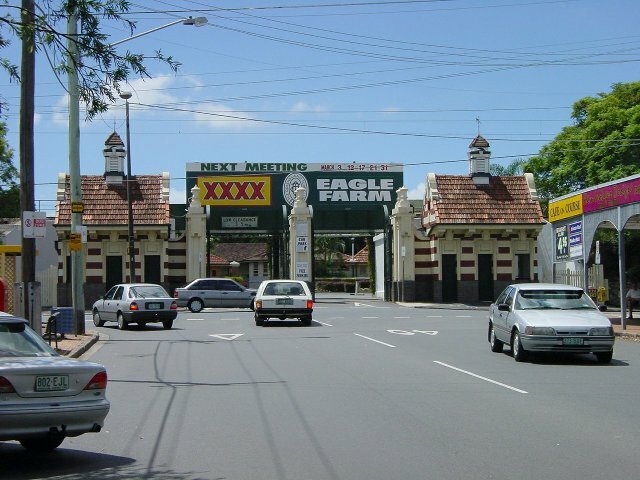 There were two race tracks near Eagle Farm airfield in Brisbane during World War 2. 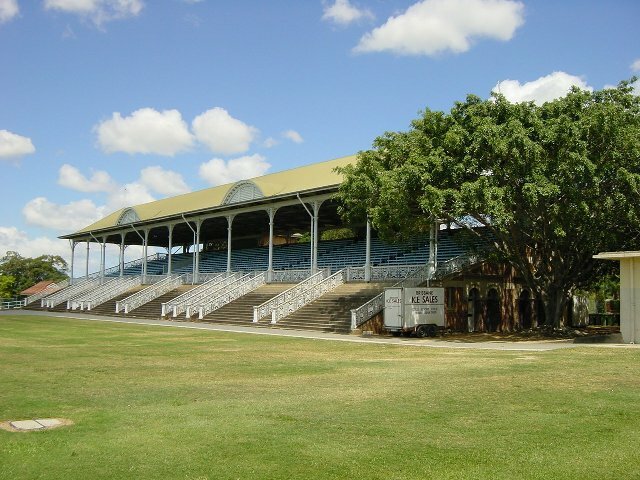 They were Doomben race course and Ascot race course. They were both taken over and converted to Military Camps. 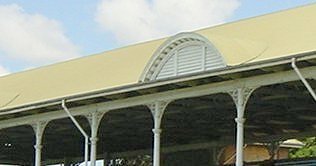 One was known as Camp Doomben and the other was Camp Ascot. 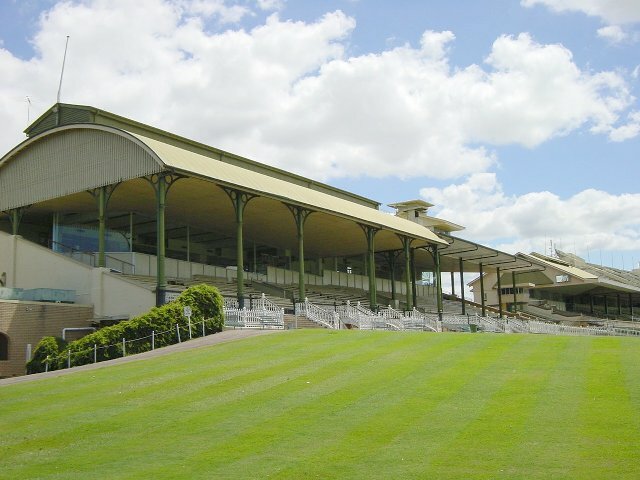 The only horse races held in Brisbane during World War 2 were at Albion Park race track. 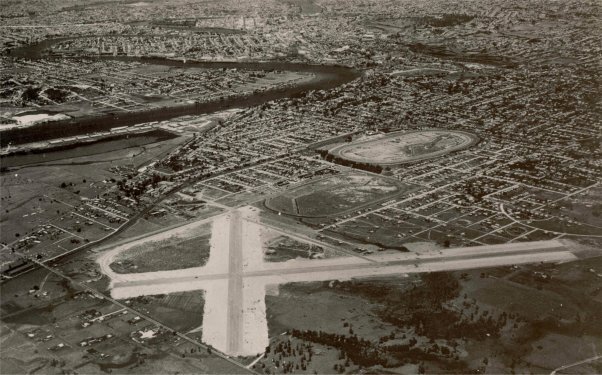 Camp Doomben in the foreground and Camp Ascot at the rear in 1942. 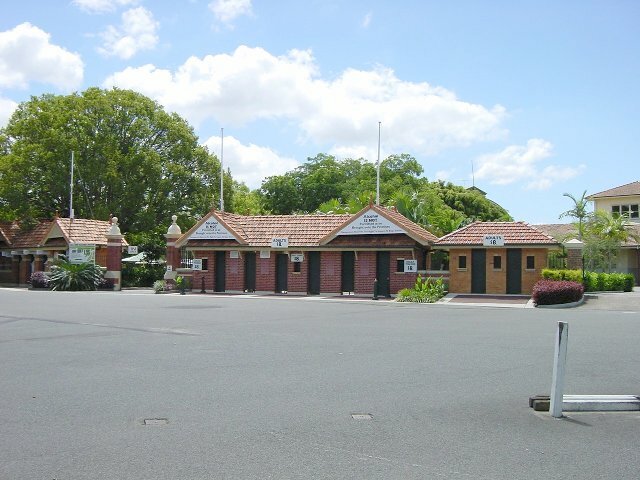 Camp Doomben and Camp Ascot were located on either side of Nudgee Road. 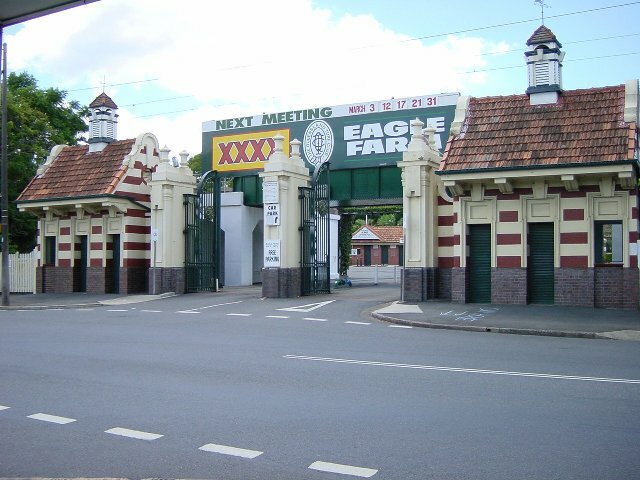 Camp Ascot is still a race track and is now called Eagle Farm Race Track. 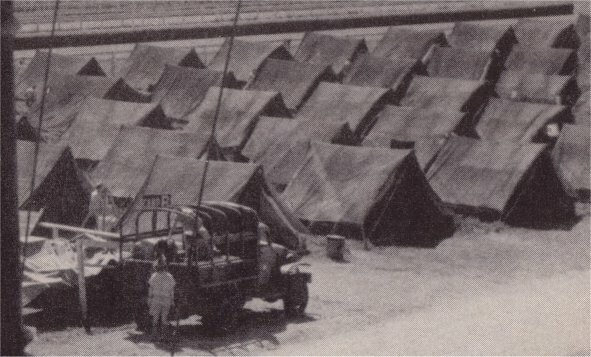 During the war, the middle of both race tracks were filled with tents. The 2nd Battalion of the 131st Field Artillery Regiment was amongst the many units that arrived in Brisbane in the Pensacola convoy on 22 December 1941, Major General Julian F. Barnes was the senior officer and he established the first U.S. Headquarters in Australia, in the Lennons Hotel in George Street, Brisbane. The 2nd Battalion of the 131st Field Artillery Regiment disembarked from the USS Republic on 23 December 1941 and marched to Camp Ascot where they slept in tents that had been set up for them. The 35th Fighter Group was one of the many units which camped at Camp Ascot during WW2. The 35th Fighter Group comprising the 39th, 40th and 41st Fighter Squadrons and Headquarters Squadron departed San Francisco, California on 31 January 1942 aboard the US Army Transport Ancon as a skeleton organization and arrived in Brisbane on 25 February 1942. 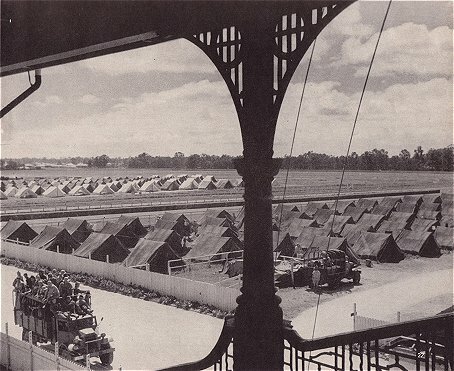 After our arrival on 25 Feb ' 42 at Brisbane, we were immediately trucked to Ascot Race Track. Apparently it is the same Ascot Camp you mentioned. I vividly remember the week we spent there -- at least portions of it. Our tents were small, white and low to the ground; too low to stand erect. Obviously intended only for sleeping, they accommodated two to four men -- can't recall how many. I do recall our first meal: Curry, prepared by Aussie (army?) cooks. Fortunately, we soon found outside sources of more appetizing food such as fresh pineapple, solid chocolate candy from Tasmania and other goodies. Undermanned and without aircraft, we departed Brisbane on 4 March aboard the USAT Hugh L. Scott and arrived in Melbourne on 8 March 1942. The second time I spent a few days at Brisbane was the end of June ' 43. The C-47 that took a load of us from the Port Moresby area landed after sundown at Archerfield. We were bussed to a downtown hotel where we were directed to go to the second floor. There, waiting for us, were several long tables covered with white table cloths and adorned with honest-to-goodness silverware, dinner plates, glass ice tea glasses filled with genuine ice and tea, and other items we had not seen in several months. As we sat looking at all those almost-forgotten appurtenances, we began to giggle like a bunch of school girls. The food served us was another thing that was unexpected. But, due to shrunken stomachs resulting from months of eating only enough to keep from starving, most of us could devour only a portion of what was before us. Afterwards, we were directed to rooms containing beds with genuine mattresses and sheets. You may wonder why I've described such a seemingly mundane occasion. The reason is simple. A mere few hours earlier we were "existing" on field rations, drinking warm highly-clorinated water, sleeping on canvas cots with only a wool blanket beneath and one for cover, and having our nightly rest frequently interrupted by an enemy bomber or two. It was like going from an uncivilized part of the world to one we had often dreamed about. The 68th Pursuit Squadron (Interceptor), 58th Pursuit Group (which later became the 58th Fighter Group), boarded a ship from Oakland, California on about 17 February 1942 and headed for the South West Pacific Area of the war. They arrived in Brisbane on about 8 March 1942 and camped at Camp Ascot. They moved to Amberley Airfield west of Brisbane on 16 March 1942, then moved to Tongatabu, Tonga Islands on about 16 May 1942. 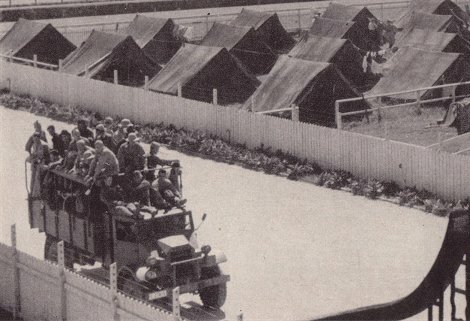 Units of the 738th Military Police Battalion left Camp Prospect in Sydney by train for Brisbane on 19 August 1942. They initially camped in Camp Ascot. On 27 August 1942, Headquarters and Headquarters Detachment, the Medical Detachment and Companies "B and "C" were moved by truck from Camp Ascot to Camp Columbia some 13 miles away. There they underwent training for street and wharf duty in Brisbane. 73 Anti-aircraft Searchlight Company (73 AASL) arrived in Brisbane on 8 November 1942 and moved to Camp Ascot before moving to Yeerongpilly or Tennyson on the bank of the Brisbane River on 13 November 1942. There were 5 officers and 127 Other Ranks. The 166th AAA Gun Battalion travelled to Australia on the USS West Point, arriving in Sydney on 10 October 1943. After a short stay at Camp Warwick in Sydney they left on about 8 November 1943 for the long journey north to Townsville. 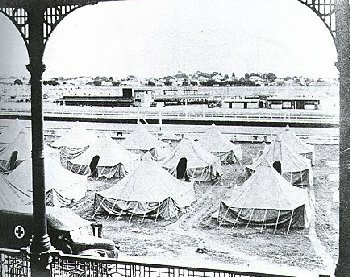 They camped overnight at Camp Ascot (possibly on 9 November 1943) to break the journey to Townsville. On 1 April 1945, personnel of 77 Wing and 1st Tactical Air Force Air Support Sections operating as part of No. 1 Air Support Unit moved from Strathpine to Camp Ascot, the American Staging Camp. On 2 April 1945 they boarded the Liberty Ship "Morgan Robertson" and departed for Morotai. My General here, MG Retired Alfred C. Harrison was stationed at the race track in WWII. He lived in the stables next to the track, across from the tents. He is trying to find if anyone has photographs of the area during WWII. He says that the place was very beautiful. He has written to the Mayor of Brisbane, but no help yet. Do you have any information on the area. If so, Please let us know. He was in the 5TH Replacement Depot, REPO DEPOT, APO 711, he was a 1LT then, retired MG Now. He was there in DEC 42, stayed in the small stalls, which were close to the front gate, at that time. Sorry Mate, but he has no photo's. He had a Nurse girlfriend in the hospital close by. She was Australian. Gidday Mr. Dunn...You the MAN. I'd like to thank Teddy W. Hanks of the 35th Fighter Group for his assistance with this home page. I'd also like to thank Arthur B. "Buddy" Clark and Mark D. Clark for their assistance with this web page.